"We're off to a good start in 2019 with notable gains for both cars and light trucks, bolstered by the arrival of our all-new Passport SUV," said Henio Arcangeli Jr., senior vice president of the American Honda Automobile Division. "Our terrific product lineup is helping grow sales in all key segments of our business and we are achieving this success by maintaining a disciplined approach to supply and incentive spending." HR-V sales rose 4.4% in February on sales of 7,093 units, a new February record and its best month since the full impact of a flood that stopped production for four months last year. CR-V gained 1.7% in February, cresting 26,000 units for the month, while Pilot posted a strong month with sales of nearly 11,000 units. Sales of electrified models (over 4,500 units) remained strong with Insight topping 1,500 units to lead industry sales for dedicated hybrid models. Honda CR-V continues as the retail #1 CUV in America, while approaching nearly a 20% share in segment. RDX sales jumped 31.8% in February on sales of 4,965 units, a February record and the 9th consecutive month of record sales. MDX had a robust month, gaining 14.9% on sales of 3,833 units. 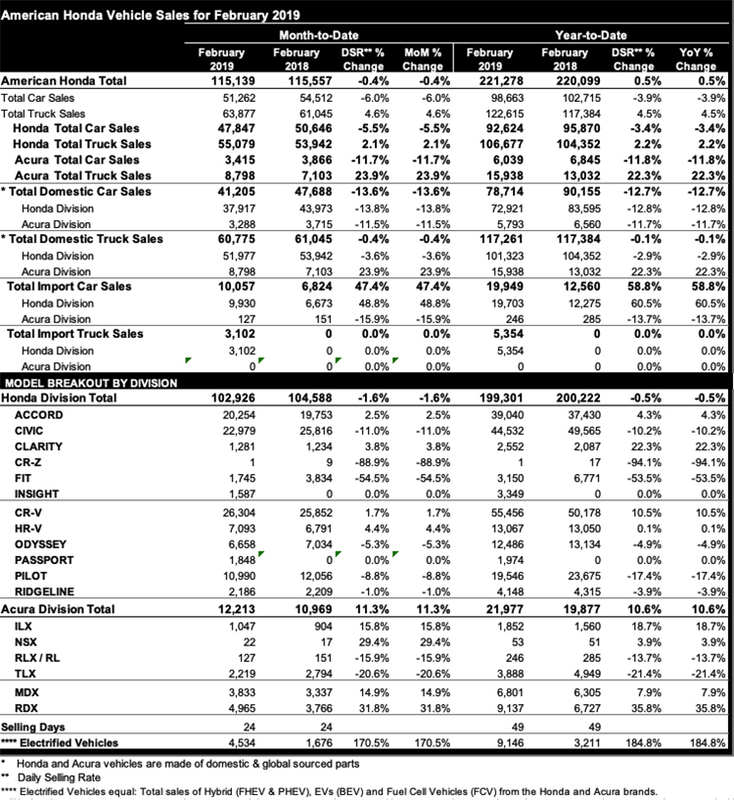 ILX sales were up 15.8%, despite inventory issues related to the ramp-up of the refreshed 2019 model. Coming off its best year ever, the new RDX has continued as the #1 retail-seller in segment, the #2 top-selling luxury SUV and the #3 top-selling model in all of luxury. Slow start for the Passport? Are NAFTA vehicles considered "imports"?